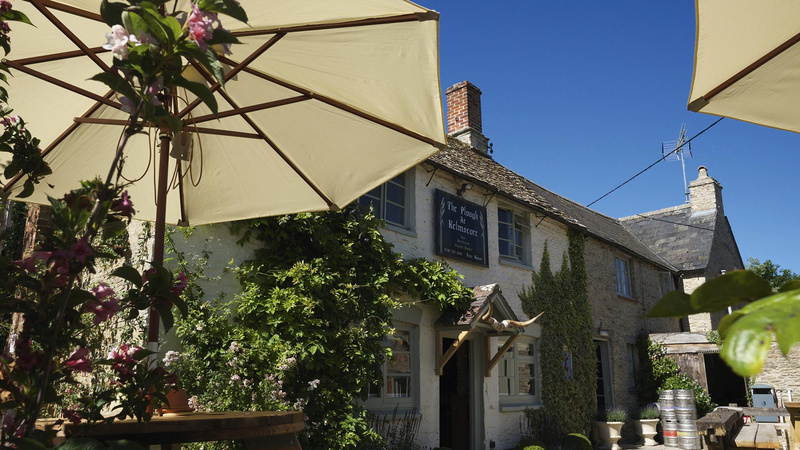 Perched on the Oxfordshire-Gloucestershire border, a two-hour drive west of London, this charming old-school boozer with rooms is probably as close as you can get to London while still being able to say you're in the Cotswolds. A charming painted-stone exterior meets raw yet cosy interiors, and a beautiful beer garden that gives the pub a great buzz in summer. What’s more, Kelmscott is one of the only villages in the West Country with a museum actually worth visiting (more on which later). It’s classic country chic with a touch of British vampishness. Downstairs, you'll find crackling fire grates, beaten-up rustic chairs, a framed Union Jack on the wall and an old pommel horse that’s now used for seating. The rooms, meanwhile, are spacious yet still cosy, with beamed ceilings, herringbone blankets, and luxurious walk-in showers in some of the bathrooms. Food here is all-English with a hearty and creative spin. Lunch on anything from a pint of prawns or scotch egg (kept temptingly at the bar) to a full-blown pub grub feast. Dinner takes things up a notch with a seasonally rotating menu that features dishes like slow-roast lamb on swede mash and pearl barley in winter, and summer salads like smoked local trout with blood orange. Kelmscott played a huge role in the English Arts & Crafts movement, namely as home to the darling of wallpaper print, William Morris. You can visit Kelmscott Manor, once his home, on Wednesdays and Saturdays between April and October. Inside the simple but towering (and we’re talking Cotswold village towering) facade, you’ll find a treasure trove of furniture dating back to the 17th century. You’ve also got access to the Thames path, which is well worth a walk, heading down the riverside to the nearby village of Buscot. Alternatively, you can rent a boat and spend an afternoon navigating the calm waterways. The nearest town is Lechlade, which is slightly more rugged than your average Cotswold settlement, but that doesn’t make it any poorer for antiques shopping, or brunching at bakehouse café Lynwood & Co (so long as you’re not still full from The Plough’s killer breakfast).